GRAND RAPIDS, Mich. — Michigan businesses celebrated their success in an energy efficiency competition — as well as the thousands of dollars they saved in lower energy bills — at an awards ceremony for the inaugural Michigan Battle of the Buildings today. The ceremony capped off the yearlong Battle of the Buildings—in which more than 50 locations throughout West Michigan engaged in a friendly race to see who could show the greatest energy use reduction—and also kicked off the 2015 competition, which includes companies from around the state, including Lansing and Detroit. Michigan’s biggest building losers of 2014 saved a total of 1149.6 metric tons of CO2e (carbon dioxide equivalent) combined — the equivalent of the annual greenhouse gas emissions from 2,737,143 miles driven by an average passenger vehicle. Competitors for the 2014 competition came from throughout West Michigan — from Grand Rapids, Kalamazoo, Muskegon, Petoskey, Holland and more. They ranged in size from smaller establishments like the Pyramid Scheme bar in Grand Rapids to the Odawa Casino in Petoskey. The competitors represented more than 11 million square feet of building space. The 2015 competition — which includes buildings from across the state — is already up and running, with 150 percent more buildings competing than in 2014. Winners of the 2014 contest were announced at the Earth Day Energy Summit, held today at the Amway Grand Plaza Hotel. The summit featured a keynote address by Valerie Brader, who made her first public speech since her appointment as the executive director of the new Michigan Agency for Energy. The Battle of the Buildings competition doesn’t favor buildings that are already “green” — rather, it recognizes buildings based on improvements from their own baseline. Building owners are awarded based on self-improvement, and winners yield the highest percentage improvement from their own baseline. 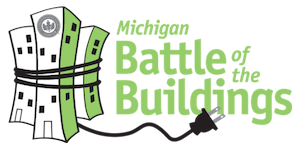 To see the full list of 2014 winners and 2015 Battle of the Buildings competitors, go to michiganbattleofthebuildings.org.